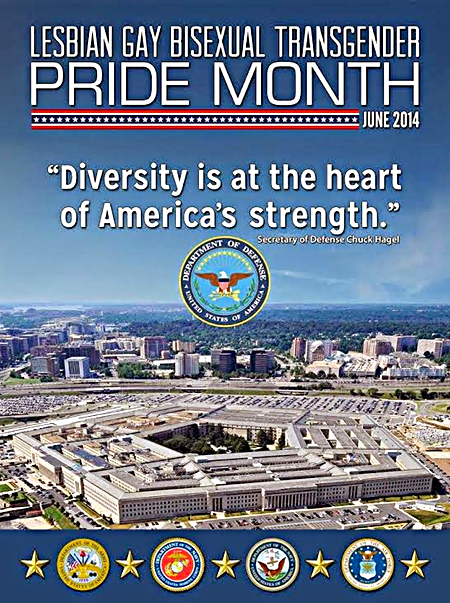 The Department of Defense issued similar flyers in 2012 and 2013 and all three include the word “transgender” despite the continuing ban on transgender service. 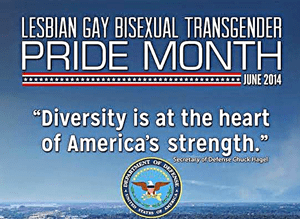 While the observance of LGBT Pride Month by the Department of Defense is yet another example of the tremendous amount of progress the observance is bittersweet at best because of the continuing ban on transgender service members. There was disappointment that some in the Lesbian, Gay and Bisexual (LGB) community would so casually turn their backs on people who are on the same side as us on every major issue: the end of DADT, marriage equality, the end of DOMA, passage of the Employment Nondiscrimination Act (ENDA), and every form of legal protection for LGB people. The implication that trans people are ballast that should be chucked overboard at the earliest opportunity disturbed me greatly. Now after 4 years U.S. Secretary of Defense Chuck Hagel has hinted at an upcoming reviews of the military’s current policy, which bans trans citizens from serving. Until we can all serve together, be treated equally and be recognized as full citizens of the United States there is no PRIDE at the Department of Defense.